Miles Brown poses with the man whose record he broke, Neil Weidman. 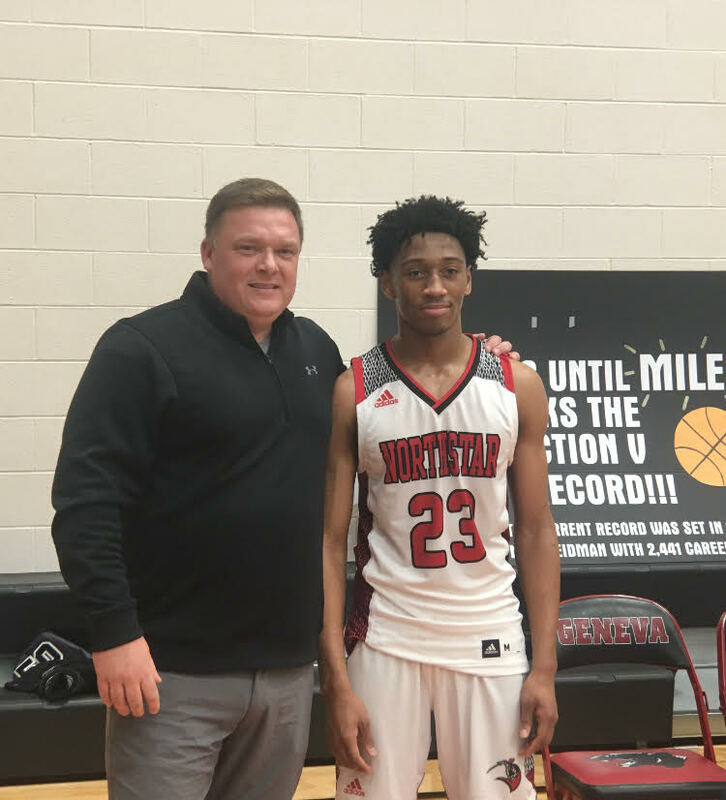 GENEVA, N.Y. — Northstar’s Miles Brown needed 24 points on Saturday night to become Section V’s all-time leading scorer, and he did that and more, finishing with 31 to pass Dansville’s Neil Weidman and set the new record. His night meant he now has scored 2,449 points in his five-year varsity career for the Knights. Read the full story of Brown’s record-setting night here. Here’s a basket-by-basket breakdown of Brown’s record-setting night. Points 1 and 2: Brown crossed over his defender on the left wing and pulled up for 2. Swish. Points 3 and 4: Brown finished with a righty reverse layup inside. Points 5 and 6: Brown drove down the middle of the lane and laid it in over the front of the rim with his right hand. Point 7: Free throw. Swish. Point 8: Free throw. Swish. Point 9: Free throw. Good. Point 10: Free throw. Swish. Point 11: Free throw. Got the roll. Point 12: Free throw. Good. Points 13 and 14: Brown stole the ball and finished in transition with his right hand. Point 15: Free throw. Swish. Point 16: Free throw. Swish. Point 17: After Brown grabbed an offensive rebound, free throw, swish. Point 18: Free throw. swish. Point 19: Free throw. Good. Points 20 and 21: Brown finished a righty reverse layup. Points 22 and 23: Brown finished a euro-step lay-in to end the third quarter and tie Weidman’s mark. *Points 24 and 25, the new record: Brown beat a total of four defenders, eventually euro-stepping and finishing with a roll off the rim. Point 26: Free throw. Good. Point 27: Free throw. Good. Point 28: Free throw. Good. Point 29: Free throw. Swish. Points 30 and 31: Brown drove right and got to the glass, laying it off the board with his right hand for two.